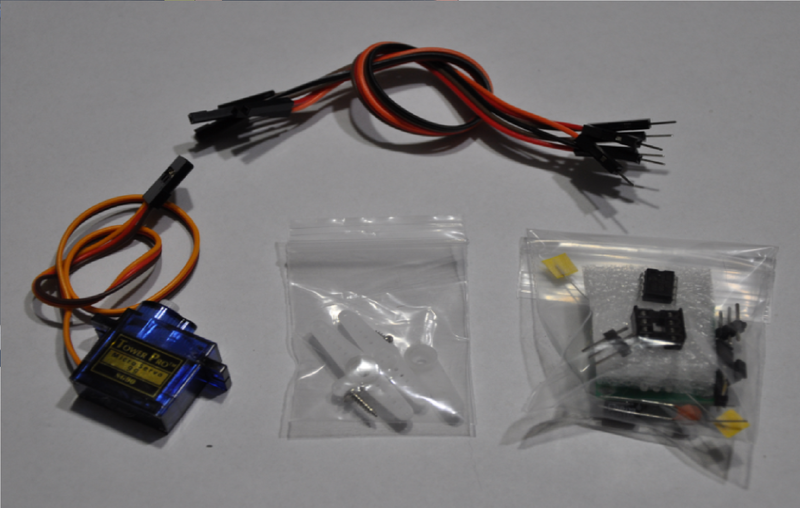 This listing is for a servo motor controller DIY electronics kit. The video above offers a full demonstration of its functionality. The video below shows you how to put it all together and test it! It offers two different programs. The default program is the toggle program, which allows for the user to toggle the included servo motor state by 90 degrees. Every time you add a pulse to the SIG line, you can toggle states back and forth. The second mode is the Sentry mode. When you apply power, the servo will toggle sates on its own. It runs back and forth at 90 degrees. We also offer this fully assembled for a few dollars more. Just check out our store! There are six interface pins. On the power supply side, the three leads are labelled "5v, SIG, and GND". This unit requires a regulated 5v power supply that can source a peak of 600mA. The motor draws a peak current of 600mA while in motion. Average current during this time is about 300mA. If you want to connect to your Arduino, you can connect the 5v pin to the 5V port on your arduino. Connect the GND pin on the servo board to the GND pin on your Arduino, and connect the SIG line "Signal" to any I/O port on your Arduino. Any TTL circuit is compatible. An active-high (5v) pulse to the signal line will trigger an action in toggle mode. On the motor driver side of the board, there are another three leads labelled "5v, MTR, and GND". Connect the 5v line from the servo board to the red wire on the included servo motor. Connect the MTR line from the servo board to the orange wire on the servo motor, and lastly, connect the GND line from the servo board to the brown wire on the included servo motor. Be sure to watch both the above and below videos for full demonstrations! If after watching the video you have any questions, let me know. I'll be happy to answer them!